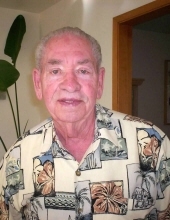 George Edward Sweat, 87, passed away March 18, 2019 at his home in Middletown CA. He was born July 10, 1931 to Henry and Nettie Sweat in Hartshorne, OK. George proudly served his country in the Navy from 1949 to 1953. George made Lake County his home for 55 years. He owned the Union 76 Station in Middletown CA for 20 years. He worked in Middletown as a barber in 1960’s and 1970’s and was also a machinist for Jacuzzi in the 1960’s. He was a Master Mason (50 years) and was very involved in the community as a boy /cub scout leader, a sports coach, Demolay youth organizations, and served as a chairman of SLCFD from 1984-1992. George is survived by Ex-wife Meriel Medrano of Middletown CA, daughter Kari Donley of Middletown CA, sister Thelma Brixey of Bakersfield CA, brother JN Sweat of Bakersfield, CA, 2 grandchildren, and 4 Great – Grandchildren. George will be deeply missed by his family and friends. To send flowers or a remembrance gift to the family of George Edward Sweat, please visit our Tribute Store. "Email Address" would like to share the life celebration of George Edward Sweat. Click on the "link" to go to share a favorite memory or leave a condolence message for the family.